CORPUS CHRISTI, TX –The era of Big Band music will sound off this weekend as one of the area’s most prominent musical leaders is honored. 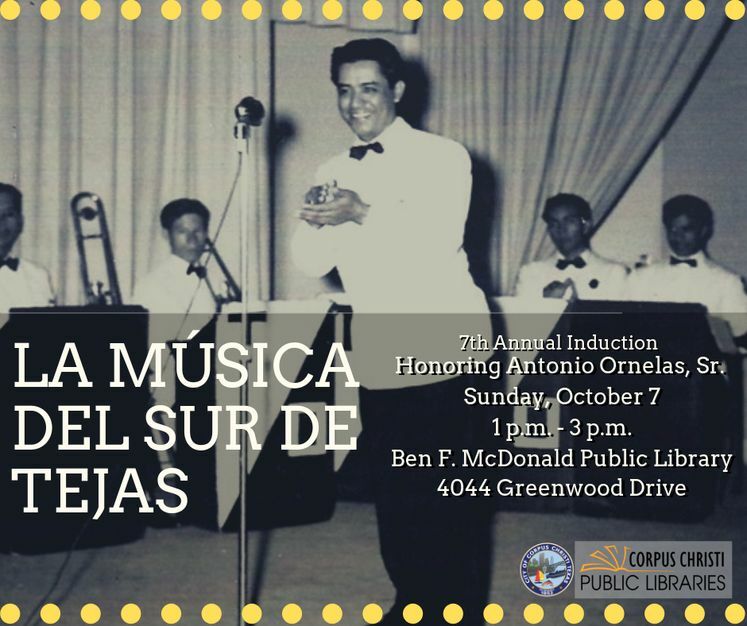 The late Antonio Ornelas Sr. better known as “El Maestro” will be recognized posthumously at the 7th Annual La Música del Sur de Tejas (The Music of South Texas) Induction, Sunday, October 7 at 1:00 p.m. at the Ben F. McDonald Public Library, 4044 Greenwood Drive. Ornelas was best known for his influence as a musician, composer, teacher and musical instrument repairman. His son, Bernardo Ornelas will accept the honor on his behalf. The ceremony will include a musical performance by Latin group, Motif, follow by a reception and gallery tour.